HERA ART is a community arts group started by Hilda Smith in 1996. Hilda has taught both children and adults, many of whom have gone on to achieve great things in the world of art. 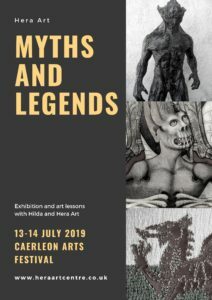 Hera will be presenting a free exhibition of students’ work on the theme of “Myths and Legends“. Children and adults are invited to try their hand at drawing and painting in free 30-minute workshop sessions.